With most Wisconsin school districts contemplating or committed to sizable local property tax increases for 2009-10 and looking at continued service and program cuts combined with more property tax increases in 2010-11, this is not the best time to be asking the voters to approve a referendum. Personal budgets are tight, the economy is uncertain and there is a delicate balance between program and service cuts as demonstrations of fiscal responsibility and program and service cuts undermining quality to the extent that it is difficult to garner further support (the “starve the beast” idea). Yet because the problems caused by the latest state budget were piled on top of 16 years of struggles due to the broken state school finance system, some districts feel they have no choice. These include ones seeking building projects, ones who feel they cannot endure any more cuts and continue to provide the quality of education they are committed to, and ones that are anticipating the expiration of a non-recurring referendum and the budget gap this will produce. Although there has been little or no official acknowledgment or discussion, the Madison Metropolitan School District is in this last category. At the end of the 2009-10 fiscal year, Madison will lose about $5.5 million in revenue authority for ‘maintenance and technology.” The probable cuts for 2010-11 are bad; without this money they will be more horrific than anything we have experienced lately. If the district wants to extend this authority, the time to start making their pitch is now. I hope they do and I hope they get started. Madison has not begun discussions, but others have. 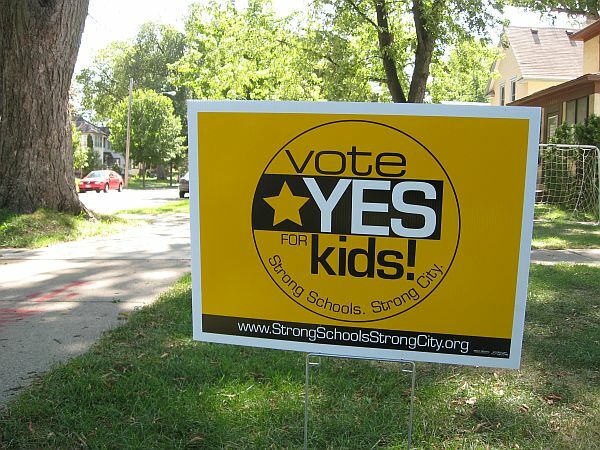 There are five referenda on the ballot at special elections in October and November 2009 and more being contemplated. Two of the ones that are set are for building projects. These are being fast tracked in order to try for the 0% interest ARRA srtimulus bonds. On November 3, voters in Pewaukee will vote on $24.95 million in debt authorization for classroom construction and other renovations, including a swimming pool (more from the district here and from a pro-referendum community group here). That same day the Trevor-Wilmont voters will decide on an $11 million plan to build an addition and renovate (more from the district here). Pewaukee is also asking for $400,000 in annual recurring authority for general operating purposes for the new facilities. Wheatland will go back to the voters on October 27, asking for four years of nonrecurring authority in the amount of $300,000 per year. Nonrecurring authority in this amount expired at the end of the 1008-9 year, so this is in a sense a renewal. BE IT RESOLVED by the School Board of the Joint School District Number 1, Towns of Wheatland, Brighton, Randall and Salem, Kenosha County, Wisconsin, that the revenues included in the School District budget for the 2009-2010 school year and for three school years thereafter, to and including the 2012-2013 school year be authorized to exceed the revenue limit specified in Section 121.91, Wisconsin Statutes, by $300,000 a year, for non-recurring purposes in order to maintain the current educational level of the District and cover shortfalls due to decreased funding.” (italics and bold added). Sad but true, the shortfalls are bigger than ever and referenda continue to be the only way to fully fund education. “When we look at the ability to improve our district with the limited increase in taxes, I think we have an obligation at least to present that to the public as an option,” said Beighley. All across the state other districts see similar opportunities to “improve,” yet know that refrerenda are difficult and the odds of passage are less than 50%, so they don’t even ask. Two districts struggling to finalize referenda plans are Wisconsin Dells and Rhinelander. [District Administrator Chuck] Whitsell also said the district is facing an $800,000 budget deficit next school year, and because of no raise in the per pupil taxing authority it has been given from the state, the district might ask taxpayers to increase the revenue limits in another referendum question. I hope they do ask for the operating money and get it. In Rhinelander the need is clear, but the path to meeting the need has been continually blocked. It is one of those districts that has been caught in almost all the faults of the current school funding system. The district is geographically large, but the economies of scale are small or negative. Enrollment has declined and incomes are not great, but property values remain relatively high. Referenda have repeatedly failed. There have been cuts for 16 years, 150 positions have been lost in the last seven years and more are on the table. Here in Madison we think we have experienced the failures of the school funding system (and we have to a great extent), but I talk to my friends in Rhinelander and can only shake my head and think how lucky we are to have avoided the full weight of these failures. Dating back to 2004, 10 operating referenda have been voted down in Rhinelander. Yet it looks like they will try again. I am filled with admiration for their perseverance and commitment. The date hasn’t been set, but the word is Rhinelander voters will get two questions this time. One will ask for three years of $1,5 million revenue authority for operations and the other is for $13.7 million in construction bonding to maintain and remodel facilities. Close and sell South Parking building, requiring a mandatory grade re-configuration, for a savings of $117,000. Close and sell Cassian-Woodboro building, with an accompanying grade re-configuration, for a savings of $120,000. Reduce extra-curricular activities for a savings of $27,800. Reduce custodial staff, for a savings of $472,000. Reduce regular education paraprofessional staff, for a savings of $200,000. Reduce full-time teaching staff by 12.5 by raising class sizes from the current low 20s to low to mid-30s in grades 4-12; or by reducing electives at the middle and high schools; or by doing a combination of larger class sizes and the reduction of electives, for a savings of $1 million. Reduce full-time staff, raise class sizes and reduce electives to achieve a savings of $296,000. Decertify the elementary and secondary charter school and absorb these students into the other district school buildings for a savings of $240,000. Reduce high school graduation requirements and move to a six-period day; reduce staff at the middle school and eliminate all professional travel and staff development, for a savings of $160,000. Eliminate all Fund 10 staff development and travel and impose a moratorium on the acquisition of textbooks and instructional materials; eliminate middle school activities and travel; reduce administration staff, for a savings of $320,000. Move 7th and 8th grade to the high school building; with grades 3 – 6 moving to the middle school building to reduce full-time staff, for a savings of $240,000. Close and sell Crescent school building for a savings of $125,000. Moratorium on all maintenance upkeep and repair of buildings, except for emergencies, for a savings of $500,000. This is the destruction of public education. This is the inevitable result of what Ruth Page Jones has called the “Going out of Business Plan” that is Wisconsin’s system for investing in education and the future. Next time the Governor or a Legislator starts gabbing about how “education is a priority we protected in the state budget,” drop them a line and ask about Rhinelander. Ask them if education has been “strengthened” as their political mouthpiece claims. Ask them what they are going to do to fix the mess they have made and inherited. And be proactive. The best way to help the children of Rhinelander and Wisconsin is to work for change via the Wisconsin Alliance for Excellent Schools (WAES). Our state needs to look for ways to fully fund the education of every child in every district, we need to consider a “Cents for Schools” dedicated sales tax, we need to make sure that the money is going where it is needed most, we need to do better. WAES is the loudest and clearest voice saying these things. Lend your voice and make the call for reform even louder. The Wisconsin Dells Board approved a November 3 $2.3 Million Bond referendum. No operating revenue measure was included.